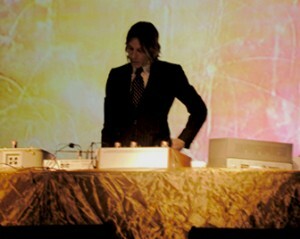 I recently discovered a new musical artist I enjoy named William Basinski. The first time I heard it was on the Last.fm station for artists similar to Geir Jenssen. I had no idea who he was though I enjoyed the slow building and atmospheric loops from the track D|P 6. A quick Google search revealed (after the 15-20 minute track finished) that this was from an album titled The Disintegration Loops. The album was recorded from loops on magnetic tapes that because of age decayed until they would never be played again. By archiving the loops digitally they would never be played the same again from their analog source. A fairly interesting concept in our copy and paste world. Oh, and he recorded this the night of September 11, 2001 in his apartment one nautical mile from the World Trade Center in Brooklyn. The moment that people said changed the world, at least until the next event that changes the world. Did I mention Michael Jackson died? I also found a Pitchfork review of the album giving it a 9.4 out of 10. I despise Pitchfork. Mainly because they rarely review artists I like and when they do they rarely discuss the actual work in question. Largely their reviewers tend to focus their take on the fans, why they do not like a genre, or are simply trying too hard. I think David Cross said it best. The said review goes in length about Basinski’s process in the tapes being destroyed. It remains unclear the reviewer knew this and to be fair he says “The process may be the hook for this sprawling four-disc set.” This might be the best Pitchfork review I’ve read to date as he was not trying to be clever by trying a sophomoric trick. It seemed almost too good to be true, and in the end it was. A conscientious pianist who had enjoyed an active if undistinguished career in London falls ill and retreats to a small town. Here she undertakes a project to record virtually the entire standard classical repertoire. Her recordings, CDs made when she was in her late 60s and 70s, are staggering, showing a masterful technique, a preternatural ability to adapt to different styles and a depth of musical insight hardly seen elsewhere. It was too good to be true. The artist Joyce Hatto‘s husband has considerable audio engineering credentials. He took it upon himself to take recordings of other obscure and younger artists and pass them off as his dying wife’s own work. Before this people were astounded at the beauty of the swan songs produced by an undiscovered talent. Was it really the beauty of these recordings or the beauty of the story? Piano aficionados– more than most other audiophiles– generally view their music through an objective lens. In the case of Joyce Hatto, a good story fogged the lens. Thankfully, I’m glad I discovered William Basinski without the compelling background story. He may live in the same city, in the same borough, and have a thought provoking process but at least I know the music stood on its own for me. Personally I prefer the robotic reviews by Last.fm and Pandora to any music review with bias. “It features electronica roots, trippy soundscapes, headnodic beats, unsyncopated ensemble rhythms and subtle buildup/breakdown” sums up things nicely. Jesus Grassdancin' Christ, Obama… Bud Light?